I probably have high cholesterol. 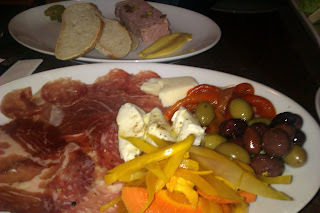 I need to stop eating anti-pasta and charcuterie every week, but it is just so delicious. This anti-pasta plate from Cioppino, pictured above, was really fantastic. The meats were fresh, recently sliced and flavorful. I was very appreciative that the plate came with a variety of vegetables and two different types of cheese (buffalo mozzarella and provolone.) The prosciutto in particular was so good that I think they must have purchased it from a specialty vendor in the Strip District. If you look at the very top of my picture you can see the pate I had as my second course. The pate was not good at all - I'd even venture to call it lousy. We could not get it to spread and spreading is half the fun. If the flavor had been acceptable I might have forgiven the pate for the poor texture, but the flavor was also lackluster. Don't get the pate! I've heard very mixed reviews of Cioppino, but overall I really liked it and I would go back. The happy hour was well attended and there was even a band afterwards. Be sure to dress for success as I noticed that everyone in attendance was very well kempt. (One patron even commented how out of place he felt in his sports apparel.) Also, make sure to check out the cigar room. It was surreal, almost what I would expect a country club to look like in the 1950's. If I knew Don Draper, I'd take him to Cioppino.